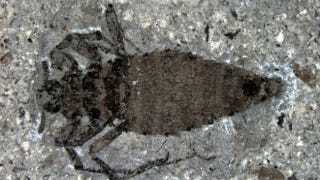 This fossil reveals a flea that is about twice as big as any known species alive today. It dates back about 165 million years, and its razor-sharp mouth likely evolved for one purpose: to pierce and feed on dinosaur hides. The fossil is one of about nine fossil specimens recently analyzed by paleontologists at the University of Kansas. Led by palaeoentomologist Michael Engel, the goal was to extend the understanding of the flea fossil record back to before the extinction of the dinosaurs 65 million years ago. We now know that fleas like the one up top were about eight to 21 millimeters long, which is gigantic compared to modern fleas which clock in at a relatively paltry 1 to 10 millimeters. The Jurassic and Cretaceous fleas lacked the spring-legged, jumping specializations of modern species, and their siphoning mouthparts were armoured structures studded with saw-like projections, unlike the smooth jaws of modern fleas. How these traits relate to the lifestyle of the fleas is difficult to determine, says Engel, but they may indicate that the fleas were ambush specialists, which caught meals by "hiding in the periphery and then scrambling onto the host for brief periods to feed before bolting again." According to Engel, there would have been little point in evolving such fierce mouthparts to just use them on soft targets like early mammals and birds. In this case, it's almost certain that the fleas preyed primarily on dinosaurs, whose ultra-tough skin would have required mouths like these to pierce. That also would explain why these giant fleas thankfully disappeared from the fossil record as the dinosaurs were wiped out - without their primary host around anymore, these parasites no longer need to be quite so completely terrifying. Original paper and news report at Nature. Image by D. Huang et al, Nature.